In a medium sized saucepan, bring one cup of water to a boil over medium high heat. Add the quinoa to the boiling water and stir. Cover and lower heat to simmer. Let stand for 15 minutes or until all water has been absorbed. Place in a medium bowl and set aside. Wash and cut broccoli crown into bite sized pieces (about one inch pieces). Fill a medium saucepan three quarters full of water and bring to a boil over medium high heat. Add cut up broccoli and cook 5 to 7 minute or until crisp-tender. Do not over cook. Drain broccoli and add to quinoa. Pour over the broccoli and quinoa. Add the cranberries and mix well. This recipe can be served warm or cold. 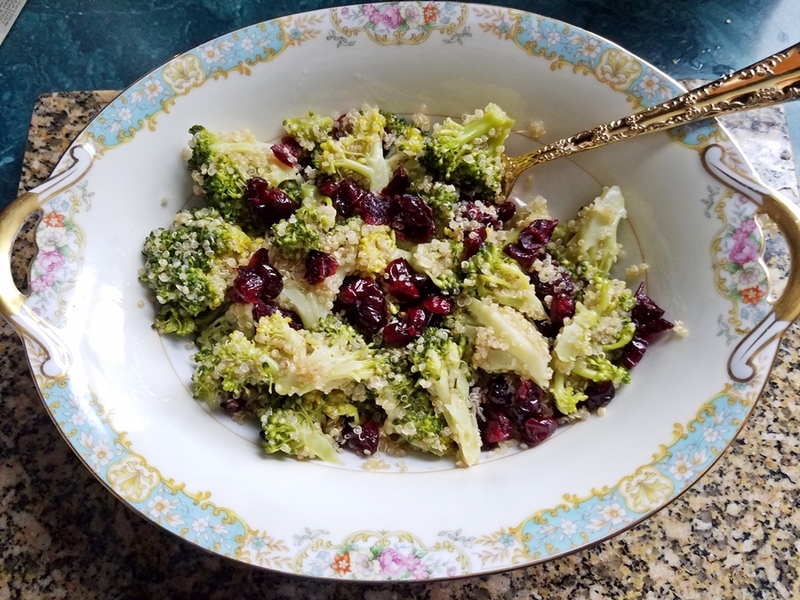 Broccoli Cranberry Quinoa Salad with Honey Lime Dressing. This is a delicious and healthy side dish or salad; vitamin packed and full of antioxidants. Easy preparation with just six ingredients!